An outdoor area can be a stunning centrepiece for your home, a private hideaway to enjoy, a spot for a bbq & entertainment and a great place to spend time with the family. On top of that, it’s the perfect location to relax at the end of a long day and enjoy some of our great Australian weather. If there’s one thing better than being proud of a new outdoor project, it’s creating one that will impress your friends and family too. With the right help, you can do it all within an ideal timeframe and on a budget that suits you. This is where Everlast come in. Whether you’re looking to upgrade your whole backyard or just a part, we are the professionals who can take you from a great idea to an iconic and memorable finish. We are a one-stop-shop who provide everything you need for a stunning outdoor entertainment & living area. From landscaping and design through to building and permits, our experts work with you to bring your backyard to life. Our highly qualified tradesmen ensure only the best workmanship, service and support until your project is complete. Our materials are Australian sourced and manufactured at our factory in Hoppers Crossing, Melbourne. You can always trust us for quality and durability for a new landscape to enjoy for years to come. For your next outdoor area project, get started on the right foot and come visit the guys at Everlast. Why Choose Everlast For Your Outdoor Area? 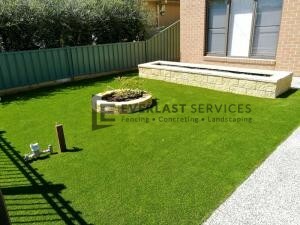 Everlast are a proud Australian, family-owned business that specialises in delivering high quality outdoor projects in Melbourne. Everlast have 20 years of landscaping experience installing beautiful outdoor areas in gardens like yours. We have the knowledge and experience to make yours a success. We manufacture steel products are our cutting-edge factory in Hoppers Crossing. That means we can pass the savings on to you for a project that always meets your budget.